PL Medical Co., LLC offers intensifying screens in calcium tungstate, rare-earth blue sensitive and rare-earth green sensitive screens. These screens are designed to be used in our x-ray cassettes or any brand cassette you may currently own and are compatible with all major brands of x-ray film. Our calcium tungstate screens use high quality phosphor processing for exceptional luminescence with an optimum combination of speed and resolution along with minimum mottle. They employ specially treated and carefully controlled calcium tungstate phosphors. These phosphors characteristically exhibit an extremely linear response over a broad kVp range. They are compatible with all major brands of blue sensitive x-ray film. Carefully selected and controlled calcium tungstate phosphor ensures low noise, minimum persistence and maximum image quality. Our rare-earth blue and green sensitive screens employ the rare earth phosphor lanthinum oxybromide and represent the state-of-the-art in x-ray intensifying screens. 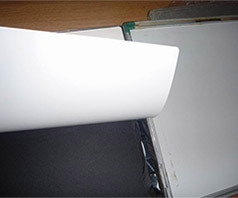 Rich blue or green component of the light output makes it particularly well suited for use with blue sensitive film. The screens are compatible with all major brands of blue or green sensitive x-ray film. Carefully selected and controlled lanthinum oxybromide phosphor ensures low noise, minimum persistence and maximum image quality. Due to significant reduction in mAs requirements, motion blur can be minimized. Radiation exposure to patient is reduced compared to calcium tungstate screens. Our screens offer excellent performance under extreme weather conditions, with total resistance to atmospheric moisture. The hard, long wearing surface is highly resistant to chipping assures minimum surface fatigue over prolonged periods of use.